Where do Thunderbird Atlatls get their names from? Back in the early ’90s when I first started designing atlatls, I was working a carpentry job in Wyalusing, PA. At the time, I was experimenting with atlatls with rests, and ended up creating one of the first original Atlatl designs in a thousand years, and the first official Thunderbird atlatl. I decided to name it the “Wyalusing” after the town I was working in — it was a word of Indian origin, and it had a nice ring to it. “Wyalusing” comes from Native American words: “Wigalusing” meaning, “the good hunting ground” and “M’chwihilusing” meaning “the place of the hoary veteran.” M’chwihilusing which was the original name of Wyalusing, prior to European settlement. Over the next year, I designed several other Atlatls and decided to keep with the theme of naming them after local Indian names — towns, rivers, lakes and such. Soon, the Wappasening, the Tioga, the Hiawatha, the Catatonk, and several other designs were born. 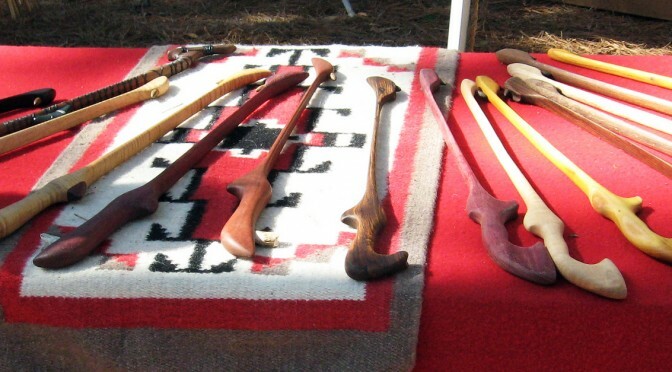 We’ve kept up with this trend for the past twenty years, and several other atlatl manufacturers that came after Thunderbird Atlatl seem to have liked this idea as well, and followed suit. Here’s a map with all of these places plotted out on a map. The red dot in the middle is our shop, and you can see that all of the Indian-named places nearby were our inspiration. Most of them come from Iroquois names – the 6 tribes that made up the Iroquois Confederation were centered around modern day New York State.